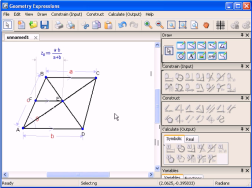 A simple example to demonstrate Geometry Expression's constraint based approach to geometry and its symbolic output capability. 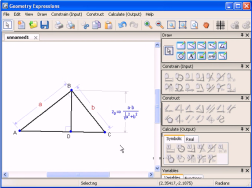 Geometry Expressions finds a surprisingly simple equation for distance from the midpoint of a trapezoid's side to its center. 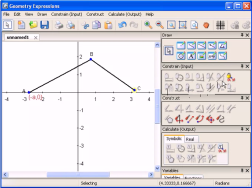 Here we demonstrate the usual string based construction of an ellipse foci (-a,0) (a,0). 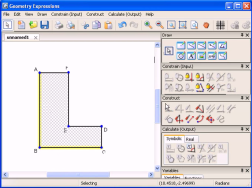 This example demonstrates how Geometry Expressions calculates area using either numbers or variables.